The Baseball season has almost come and gone, and the Red Sox offense is still a mystery to some. Are they a great offense that is bereft a power hitter? Or are they a great offense who is only going to be better in the subsequent years because many players are having down years or are injured. One thing that is true is despite all this the Red Sox and their mystery offense are 5.5 games ahead of the Yankees and look to stake their claim on the top spot in the Playoffs. What is the best lineup for the Red Sox? Who should they pencil in everyday, keeping in mind the depth of the lineup as well as who is best suited for each position in the field. For this exercise, I treated all players as healthy and not on the DL. If you listened to the Podcast this exercise was also discussed in depth then as well. A lead off hitter should do many things. One of which is getting on base as many ways and as often as possible. A lead off hitter should either walk or make contact most of the time. It is not a good sign when your lead off hitter is striking out. Eduardo Nunez is a perfect lead off candidate. He is in the perfect spot in the lineup currently. He doesn’t walk, but he also does not strikeout. He makes contact and finds creative ways to get on base. Once Eduardo is on base he has the speed to take a bag, and at the very least is going to draw the attention of the pitcher which could throw the pitcher off of his rhythm. The 2 hole is a player who also is going to put the ball in play. The second hole hitter should be a hitter who makes contact or at the very least is going to make a productive out to move the lead off hitter into scoring position. Dustin Pedroia fits this bill. Pedey does not strike out much, and he makes solid contact most of the time. He does sometimes have a penchant for hitting into a double play, but he makes up for it by working counts and getting on base a lot. It is hard to complain about a guy who has been as consistent as Pedroia has for as many years as he has been. The third hitter in a lineup should be where you start to get into the power of the lineup. The guy with the most raw power in the lineup should hit in this spot. The teams will guarantee this hitter gets a chance to hit in the first inning, and if the players ahead of him get on base, then the possibility of driving in runs with a 2 run home run is greater. I will sacrifice average for power in this spot. Hanley Ramirez. Yes that’s right Hanley Ramirez. Hanley has had a tough year, but there is not denying the fact that he posses the most raw power on the team and when he is going right he can carry an offense, as he showed last year, and is starting to show now. The Cleanup hitter is a lot like the third hitter in the lineup. A power hitter who is a little bit more of an average hitter in this spot. This spot has the potential to hit a lot with runners on base and runners in scoring position. This hitter should have a penchant for the dramatic and be a clutch hitter. 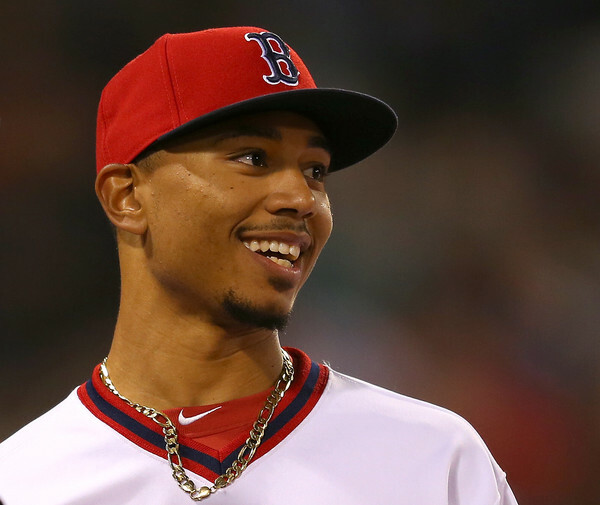 Mookie Betts is the ideal cleanup hitter. He has power, speed, contact. If the Sox are down one run in the ninth the only player that is guaranteed to almost get a hit every time is Mookie Betts. He has drove in so many runs late in games to either give or pad a lead for Boston. He is also one of the best hitters in the league with runners in scoring position. The fifth spot in the batting order is another one of those power spots. Here you want a guy who can hit the ball out of the ballpark, while also driving in some runs. Sacrificing average for power in this position is also not an issue to most. Andrew Benintendi is a good five hitter for this team. One he is the first lefty in the lineup at this point and two because of how young he is, there would be less pressure on him to succeed and drive in runs. The veterans ahead of him in the lineup should correct that. Also, hitting behind Hanley and Mookie should help Benintendi get thrown a lot of strikes, which will help him stay consistent with his approach at the plate. The six hole in a batting order is when you start to get to into the guys who can hit for contact and a little power, but may also strike out a lot. 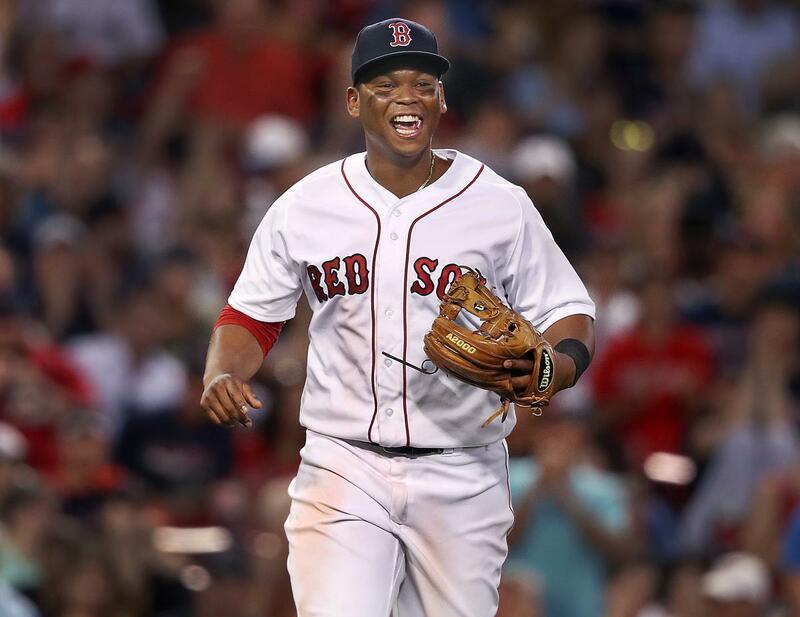 Rafeal Devers and Xander Bogaerts are good guys to hit in this spot. As Devers gets older I fully expect him to be a middle of the order bat, and hit in that position for a long time. 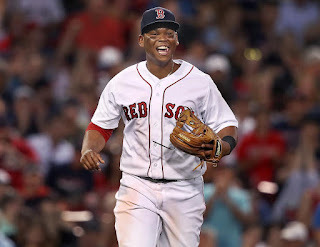 Devers will be a multi-year 30 home run guy. Since he is so young still hitting sixth where he is sure to see pitches and can develop is ideal at this stage. X is a more intriguing case as since July he looks lost at the plate and does not seem to be coming out of it any time soon. His pitch selection has gotten worse and he looks like he refuses to walk. 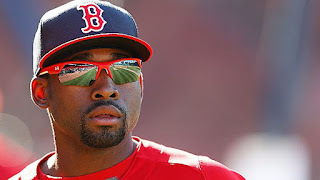 I hope X finds his way out of this slump soon, as the Red Sox will need him down the stretch and in the playoffs. The seven spot in the lineup is reserved for those guys who may not great hitters, but can hit for a little bit of power, drive in a few runs, and potentially be a thorn in a side for some teams. This spot in the batting order also will probably strike out more than their fair share, but should also walk a lot, to set the table for the top of the order and flipping the lineup over. Mitch Moreland fits the bill here perfectly. Mitch does strike out a lot, he has good power, and does not hit for a very high average. It does seem that Mitch has gotten a lot of key hits this year however, he is still subject to many prolonged slumps. The eighth spot in the lineup is reserved for the worst hitter, who could also be the slowest and worst base runners with the worst on base percentage. This spot will strike out a lot and walk infrequently. The perfect guys to hit in this spot are the catchers. Sandy Leon and Christian Vazquez, are not that bad of hitters though? That’s true, and the Red Sox have one of the deeper more talented lineups top to bottom in the MLB. Vazquez is not an automatic out and he hits for a pretty high average for a catcher. Leon swings at a lot of pitches and doesn’t make contact with most of them, however Vazquez and Leon have many more important issues to focus on during games, so any offense those two provide is a plus. The ninth spot is treated like a second lead off hitter any more. A guy who along with the lead off hitter will set the table. 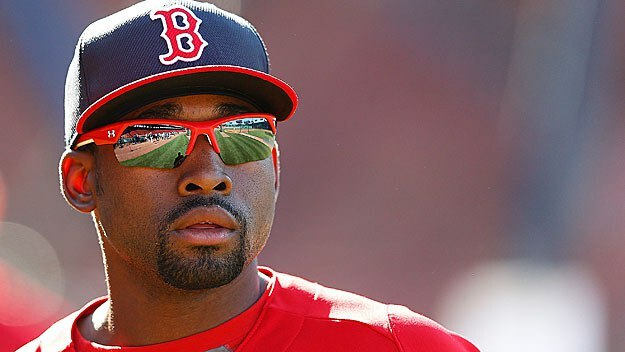 Jackie Bradley Jr. is great in this spot. Jackie could thrive in another spot in the batting order as well, but it just seems Jackie in the 9 spot is a spot he is comfortable. When Jackie hits 9th, that seems to be when he goes on his hot streaks and can flat out carry a team. His cold spells seem to happen when he hits closer to the middle of the lineup. The ideal lineup for Boston has been used this year, and the Red Sox usually score a good amount of runs when this happens. This should be the playoff lineup assuming everyone is healthy.